A poem by movie director Tim Burton about his friend Johnny Depp, published in the book Double Exposure, Take Three, by Roddy McDowell. 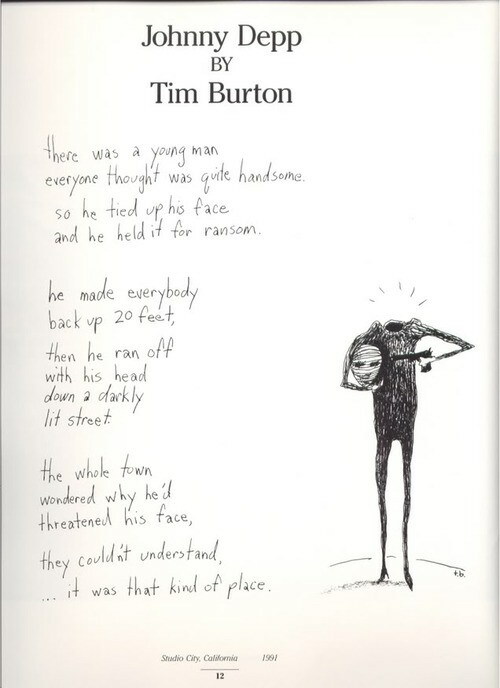 Drawing by Tim Burton. why doesn't he just shag him and get it over with? Wow, even here a troll? You feel better about yourself now? Think everybody is gonna freak out over your comment? No, I think everybody will think that it's some annoying 12 year old and move on with their lives. Try a place with people a little more your age group, like myspace. No, i quite agree. i love the idea of Tim Burton and Johnny Depp involved in a secretive sordid relationship. This just further cements it in my mind. Ha, maybe that would just produce more poems... Also, in this context, the second comment is the trollish one. What does it have to do with the article? Hey......i can feel that you have put in hard efforts to write this poem...But i love the idea of Tim Burton and Johnny Depp involved in a secretive sordid relationship. Thank u guys sharing nice info. So sad! Tim Burton is an incredible film maker, and if i were him i would pick Johnny Depp as my main character because he's so talented! Depp brings Burtons films to life like no actor could, so stop your crude comments and if you haven't got anything nice to say don't say it at all!!! Quite interesting! Though, some people really do understand what that kind of place is.. they're not alone. There are others. beautiful poem!!! !ADORE JOHNNY AND TIM.IN MY OPINION THE BEST FILM COUPLE EVER!!! !THEY MADE THE MOST BEAUTIFUL MOVIES OF ALL TIME.LOVE YOU BOTH GUYS!! !KEEP MAKING MOVIES.WE NEED THEM!!! Look people. Johnny Depp has a wife and Tim has one too. They both have kids so its probably safe to say they don't love each other although they are friends. Its PRETTY OBVIOUS!! !